The man who just might hold the key to better relations with the Muslim world is a mere 22 minute drive down Massachusetts Avenue from the White House’s Oval office. 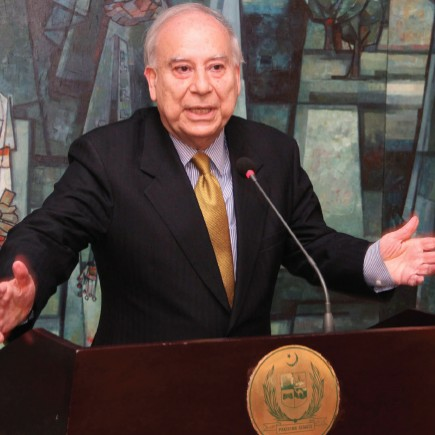 His name is Akbar Ahmed and he’s a former Pakistani ambassador to Great Britain and Ireland, a distinguished professor at American University in DC and, in the words of the BBC, “the world’s foremost expert on Islam”. Ambassador Ahmed believes he knows the key to the US having an understanding of the Muslim world, and thereby a path to reducing tensions and dispelling erroneous impressions about his faith. Of course, there is more to it than that, and the Islamic scholar is happy to explain. His credentials come from life experiences and more than a dozen award-winning books he has written, as well as documentaries and plays he has produced. Ambassador Ahmed is available to discuss his thoughts at every opportunity on college campuses, think tank meetings and in corporate boardrooms and at conferences. Ambassador Ahmed just published his acclaimed “Journey into Europe: Islam, Integration and Identity” which is a sweeping exploration of Islam in Europe. His expertise has been sought by Oprah Winfrey, The Daily Show’s Jon Stewart, CNN and literally dozens of other national programs. He’s had the honor of discussing his ideas with the late Princess Diana and various world leaders. Dr. Ahmed, the Ibn Khaldun Chair of Islamic Studies at American University, is seen as the world’s “go to” expert on issues that beg for better understanding of Islam. An accomplished poet, Ahmed’s works were broadcast from the Library of Congress in “The Poet and the Poem” podcast series. Professor Ahmed is currently working on his latest play, “Gandhi and Jinnah Return Home”. Muhammad Ali Jinnah is considered the founder and “Father of Pakistan”.